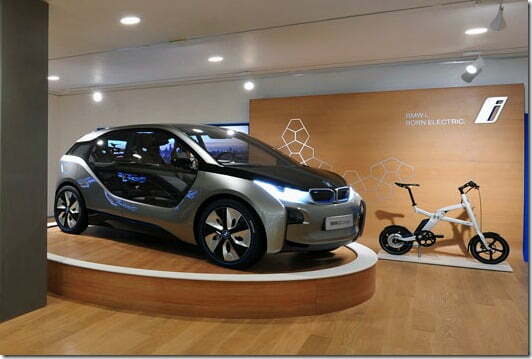 With an inspiring motto like “Born Electric”, BMW launched its all-electric sub-brand BMW i a while back. This brand is special for the Bavarian giant as it is one of the brands that will develop electric vehicles only and the very first products to come out of BMW i’s stable were BMW i3 hatchback and BMW i8 sedan. The i8 was recently featured in Tom Cruise starrer latest Mission Impossible sequel as well. The i-series if electric cars are very forward looking both in terms of styling and features. A while back Apple summoned BMW for using the “i” trademark but this has not stopped BMW from opening an exclusive BMW i store in London where it will showcase entire electric vehicle range including the current and its future vehicles. BMW has implemented an interesting strategy and has opened the store in the heart of London, in Park Lane. Being in the Park Lane, the store would have a lot of advantages in terms of number of visitors and therefore such visitors will be able to know more about what the brand is all about and what plans it has when it comes to future mobility. Another reason for opening the store at this point in time is that the London Olympics are going to take place soon and it would one of the best times to make visitors aware about the brand and its electric and plug-in hybrid product line-up. But unfortunately the company is struggling hard for the sustenance of the i brand as there is not enough consumer response. Other major factors going against the brand’s success is inadequate supporting infrastructure for electric cars, less interest towards such vehicles and billions of dollars that are at stake. As expected BMW is really calm about the dull response in the market and is sure that the hard work will eventually be paid off and soon we will see a larger number of BMW i vehicles on the roads. As of now the i3 has a tentative launch in 2013 while the i8 will be launched in 2014. We will keep you posted on the same, stay tuned.